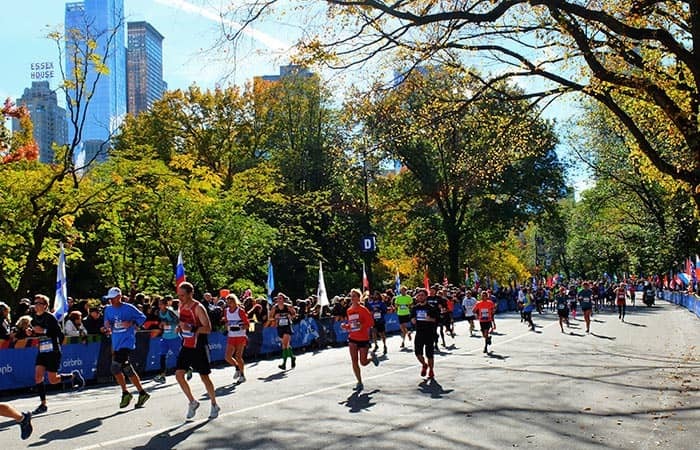 The New York Marathon takes place annually on the first Sunday of November in New York City. Each year 50,000 runners participate and the marathon attracts more than two million spectators. It is considered to be one of the biggest sporting events in the city. There are more than 10,000 international runners. 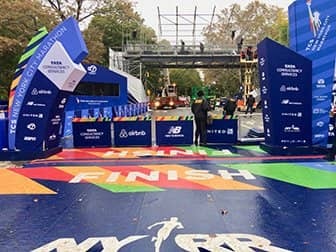 In 2019 the New York City Marathon will be held on the 3rd of November. However, the marathon activities in the city begin a week early, with a 5 mile run on the Sunday before the big day. People can only participate if they have gained entry via a marathon lottery, are running for a charity sponsor or booked a Marathon Package with an International Tour Operator. The deadline to apply for the 2019 marathon was the 14th of February 2019. For New Yorkers, gaining a spot in the Marathon is a lot more challenging. New York residents must first run in nine(!) qualifying races over the prior year in order to qualify for the opportunity to participate in the New York marathon. Those that do not, can try their luck with the marathon lottery system. In addition, everyone (from in and outside of New York) has a chance of qualifying for a spot by meeting the official time-standards. On the day of the marathon itself, the area around Central Park is completely dominated by the race. There are often heavy traffic jams in and around the park caused by road closures and diversions. 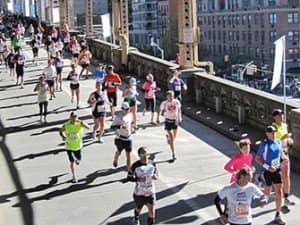 If you want to warm up a bit in the lead up to the race, there are several nice running tours in New York that you can do on the days before. For the runners, race day is, of course a very exciting day! Personally, I have never taken part in the marathon, so I can’t give any personal experience about the actual running. However, what I do know is that at various restaurants throughout the city, participants get discounts on selected meals (mostly those containing lots of carbs), when they show their starting number or medal. Due to the congestion around Central Park, taking the Hop on Hop off Uptown route is definitely not recommended on Marathon day as it is highly likely that the buses will have trouble with the traffic jams. Roughly speaking, the entire area between Columbus Circle and the East River is ‘marathon area’ and therefore will be a lot busier than normal. Eric’s Tip: Are you planning on renting a bike to explore Central Park? I don’t recommend doing this on the Saturday, Sunday or Monday around the Marathon. Due to the various road closures and diversions in the park, you won’t be able to get everywhere which isn’t handy for your sightseeing. The New York Marathon passes through all five New York Boroughs, starting in Staten Island and ending in Manhattan. It is possible to watch at the finish line but you will need to buy tickets for seats in one of the stands there. Personally I like to just stand somewhere along the route. A good location is at the end of the Queensboro Bridge, where the runners pass on their way up to First Avenue. This is the spot where they first set foot in Manhattan. Do you also want to see a bit of the last leg? Then, from here you can head over to Central Park which is just a 15 minute walk away. Marathon day itself is not the only exciting part of the occasion. In addition, on the day after there is plenty to do in the city for the runners. 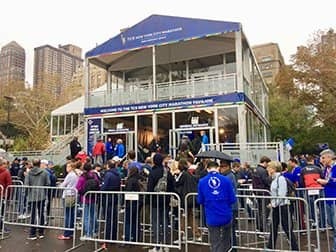 Lots of the participants return to Central Park to take photos at the finish and get their medal engraved in the Marathon Pavilion. Or to get a head start on recovery in the Runner Recovery Zone. You will see lots of people all through the city proudly wearing their medal, enjoying their accomplishment.